Here’s the scenario: sweet potato farmers in the Mukono region of northern Uganda are expecting a reasonable harvest this spring. But the country’s meteorological service has issued a seasonal forecast that doesn’t bode well. They’re predicting heavier than normal rainfall in April, and the root vegetable doesn’t like to have feet wet. If the fields become waterlogged, in all likelihood the farmers will have significant crop damage. That means smaller incomes and tighter household budgets. The double-whammy is that this might happen at the same time that parents have to pay school fees. So cash-strapped families are likely to have to make some tough trade-offs as they spread their budget between the day-to-day demands of keeping their families fed, or having to buy fuel to cook with, or pay to travel to work, or get their kids into school. How can local governments respond in a way that will support a community or household like this through the economic shock that comes from weather-related crop losses? More than that, how will state decision-makers even know, ahead of time, that they have to plan for this eventuality? This is precisely the kind of situation that a new digital tool hopes to resolve, according to Dr Celia Petty with the UK-based non-governmental development organisation Evidence for Development (EfD). The EfD team, associated with the Walker Institute, is part of a multi-disciplinary research team Future Climate for Africa (FCFA) that is working in East Africa to design a ‘big data’ solution to small scale farming challenges in a region where rising temperatures and increasingly unpredictable rainfall patterns could threaten families’ livelihoods in future. ‘Big data’ is the jargon that refers to the kind of computing technology that takes large data sets, often from multiple sources and analyses them for trends or patterns. In this case, the software under development is called the Integrated Database for African Policy-Makers (IDAPS) and, according to the research team, will pull together information relating to ‘crop yields, hydrology, meteorology, agronomy, fisheries and livelihoods’. It will analyse these data sets in a way that will help the end-users understand how projected climate variability or change may hit communities in East Africa. The tool is designed specifically to be used in the field: it needs to have a simple and easy-to-use dashboard; it needs to be able to upload or download data and analysis in a low-bandwidth situation; and it needs to be accessible to people who are familiar with simple and portable digital interfaces, such as smartphones. But a sophisticated computing system will sit behind the straightforward dashboard interface, explains Petty. Researchers will go into the field to conduct specific surveys or gather data from within communities. They’ll input their data into the system while they’re in the field, checking for errors and improving their data capture processes as they work, and will then upload all this data into the digital ‘cloud’. This is where the computing technology will analyse the data for trends, and produce various interpretations of the information. Government officials, technocrats, decision-makers, or development workers can then access the results of this analysis through the dashboard, and start planning accordingly. In the scenario of the flooded sweet potato crops, local government could respond to the IDAPS analysis, and the warning it gives about the financial knock families might take in the upcoming season, and consider what kind of policy measures they can take to help those families through the year until their next harvest is ready. First IDAPS stakeholder consultation where an initial set of use cases were developed by future users of the platform. The meeting was hosted by the Uganda National Council for Science and Technology (UNCST). Key attendees included the leader of the Parliamentary Forum on Climate Change; the Assistant Commissioner, Ugandan Ministry for Water and Environment (MWE); Deputy Executive Secretary of UNCST; a senior representative from Uganda’s National Emergency Coordination and Operations Centre; senior district level technical officers, and representatives of civil society climate change advocacy groups. The IDAPS tool is currently under development, after a series of workshops with farmers, civil society organisations and government stakeholders, to get an understanding of what their needs are. 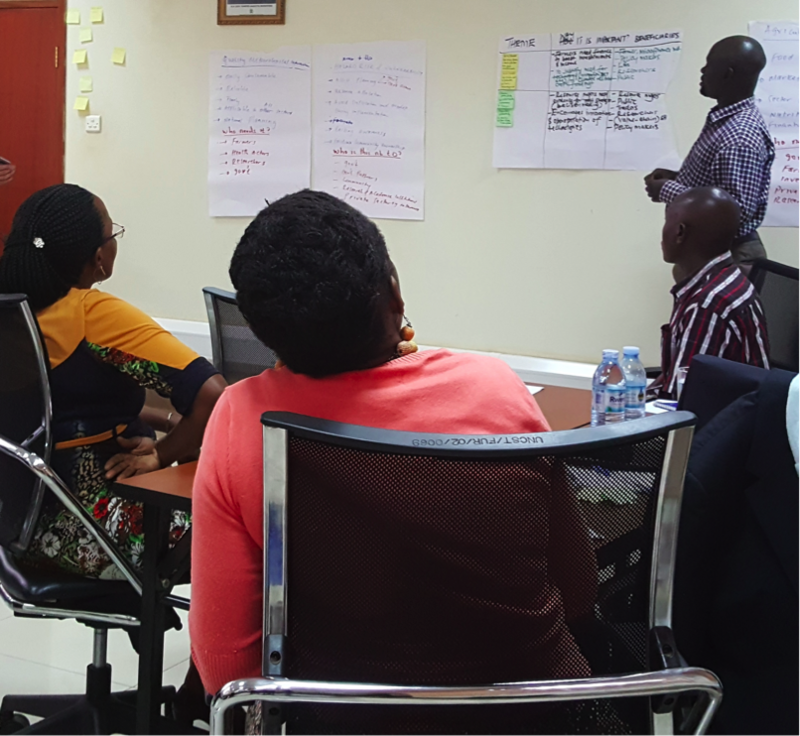 The IDAPS team plans to pilot the tool at a gathering later this year in Kampala, Uganda. The FCFA work covered in this story is part of the Integrating Hydro-Climate Science into Policy Decisions for Climate-Resilient Infrastructure and Livelihoods in (HyCRISTAL) team. HyCRISTAL aims to develop a new understanding of climate change in East Africa and to work with the region’s decision-makers to manage water for a more climate-resilient future.